President Trump has asked Congress to impose an $18 billion cut in non-defense spending in its appropriations legislation for fiscal year 2017. According to a leaked document, the White House has suggested that about $3 billion be taken from R&D programs. Several key congressional appropriators have said it is too late in the fiscal year to consider such large cuts. To fund an immediate increase in military spending and a southern border wall, the Trump administration has asked Congress to impose $18 billion in cuts to the fiscal year 2017 non-defense discretionary budget, including about $3 billion in cuts to federal R&D programs. A proposed distribution for these cuts is detailed in a White House Office of Management and Budget spreadsheet obtained this week by various news outlets. Titled “FY 2017 Reduction Options,” the spreadsheet does not have any binding authority, and Congress may well end up disregarding it. Nevertheless, it does provide insight into the administration’s thinking about R&D funding priorities. 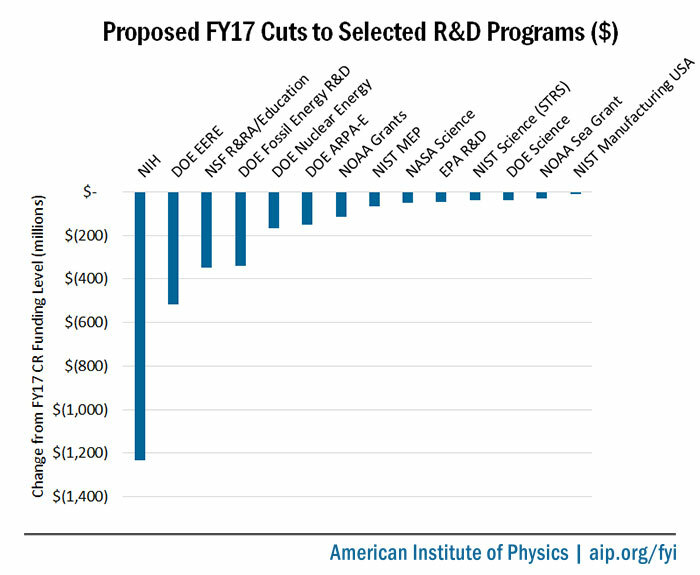 Proposed cuts to R&D exhibit a slight preference for targeting big-budget programs. However, in terms of percentage of agency and program budgets, the cuts reflect a clear set of priorities. The administration wants to cut back immediately on programs that conduct and fund applied R&D and that provide assistance in technology commercialization. This is consistent with the administration’s stated desire to pare back certain agencies to their “core” missions and to divest from activities regarded as the private sector’s responsibility. While basic research programs would also be subject to belt-tightening, those cuts are more modest and show no obvious preference for cutting certain fields of research over others. 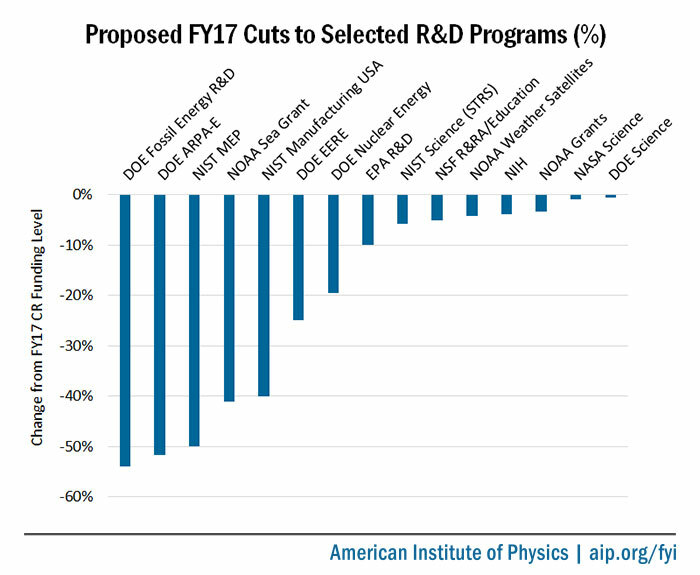 The proposed cuts reflect a desire to cut back immediately on programs that conduct and fund applied R&D and that provide assistance to technology commercialization efforts. Two additional points should be made, given that fiscal year 2017 is already about half finished. First, if enacted, agencies would have to rush to implement recommended cuts by the end of the fiscal year on Sept. 30. Also, by the time appropriations are enacted, agencies will generally already have obligated their spending for more than half the fiscal year. Therefore, cuts would have to be taken entirely from those funds not yet obligated. To roughly approximate annualized funding levels for the levels that would be experienced during the remainder of the fiscal year, double the stated percentage being cut from the agency budget. The spreadsheet sheds light on the administration’s intentions toward two science agencies largely ignored in its budget blueprint: the National Science Foundation and the National Institute of Standards and Technology. According to the spreadsheet, NSF should have its current budget cut by $350 million, or 5 percent, which would reduce the number of grants awarded through September. This is consistent with the 10 percent blanket reduction the budget blueprint assigned to “other agencies,” a category that presumably includes NSF. The relatively moderate cuts the spreadsheet prescribes for NSF and NIST’s science programs are roughly in line with cuts other basic scientific research programs in the federal government would receive. The Department of Energy Office of Science is also targeted for a 1 percent cut, or $37 million, which would be absorbed by a reduction in the number of grants to universities. The administration’s budget blueprint proposes a much steeper cut of $900 million, or 17 percent, in fiscal year 2018. Weather satellite programs at the National Oceanic and Atmospheric Administration would see a $90 million, or 4 percent, cut. According to the spreadsheet, “This level reflects the planned ramp-downs of JPSS and GOES weather satellites, and the ramp-up of the [Polar Follow-On] program. This level also delays the [Earth Observing Nanosatellite] contingency mission which is not funded in the Congressional marks.” The budget blueprint did not offer a specific figure for NOAA’s fiscal year 2018 satellite budget. The spreadsheet proposes cutting “various” NOAA grants — including, but not limited to, research grants — by $115 million, or 3 percent of current levels. This excludes NOAA’s Sea Grant program, which the blueprint proposes to eliminate, and would see a cut of $30 million, or 41 percent, in fiscal year 2017. National Institutes of Health research grants are targeted for a cut of $1.182 billion, which is about 4 percent of the agency’s budget. In fiscal year 2018, the administration is proposing a larger cut of $5.8 billion, or 18 percent. The administration’s budget blueprint proposed drastic cuts for many applied R&D programs and certain grant programs. Its spreadsheet makes clear that it would like to impose the brunt of these cuts as soon as possible. As already mentioned, NIST’s Manufacturing Extension Partnership program and NOAA’s Sea Grant program, both proposed for elimination in fiscal year 2018, would be cut in fiscal year 2017 by 50 and 41 percent, respectively. Figures are in millions of dollars. The 2017 CR funding level figure for the Office of Fossil Energy Research and Development does not take into account $240 million available from prior year balances. The spreadsheet suggests that R&D programs at the Environmental Protection Agency receive a cut of $48 million, or 10 percent, which would fall on “climate-related research (such as EPA’s contribution to [the U.S. Global Change Research Program]) and lower-priority extramural research grants.” The budget blueprint prescribes a much larger cut of $233 million, or almost 40 percent, for EPA’s R&D office in fiscal year 2018. For the proposed fiscal year 2017 cuts to be enacted, Congress would have to incorporate them into the appropriations bills it is currently negotiating. This legislation must be completed and signed before the continuing resolution currently funding the federal government at fiscal year 2016 levels expires on April 28. If Congress and President Trump cannot agree on appropriations legislation, Congress could pass another continuing resolution. If no legislation is passed, the federal government would shut down. I doubt there’d be a lot of appetite for dramatic cuts this year. I just look at it as a conversation. They’ve got their views, and we’ve got our views, and we need to sit down and work that out.